From a very early age my parents took me and my sister to visit gardens. 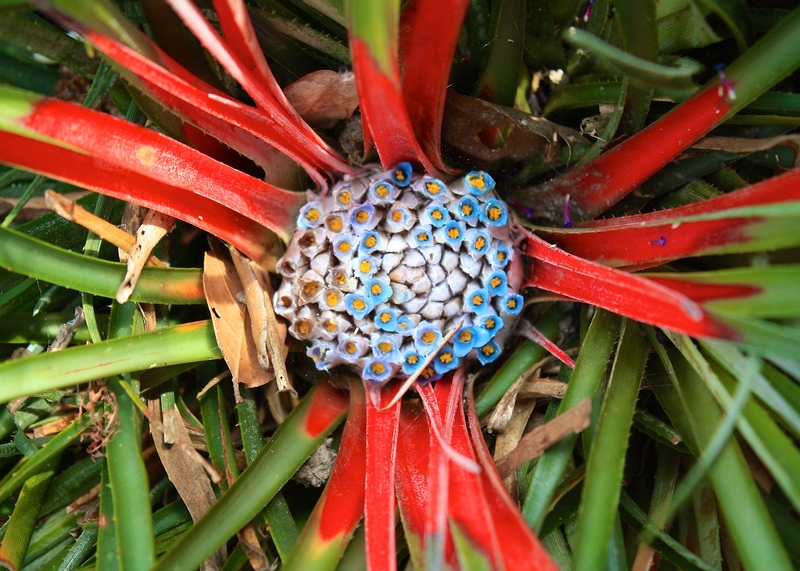 I like to think the reason was to cultivate our interest in flowers and plants, but as one follower of this blog commented recently (with reference to another Cornish garden, Trebah), it was probably to keep us both from wreaking havoc elsewhere. The upshot of all this outdoor activity, which worked for me either way you choose to look at it, is that I have enjoyed a lifelong relationship with a handful of gardens, mainly in Cornwall. Return visits to these precious spots are imbued with a completely different sense of understanding and recognition. Without thinking I can spot where trees have grown or been felled, where standards have fallen or new opportunities opened up. It’s like seeing an old friend who has moved abroad and returns home once in a blue moon, except I am the one doing all the travelling. 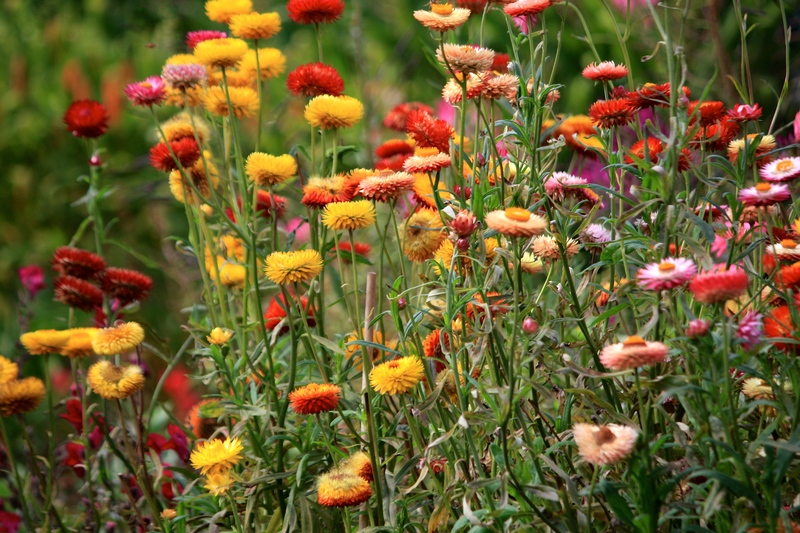 We were never without helichrysums (Xerochrysum bracteatum) when I was growing up. 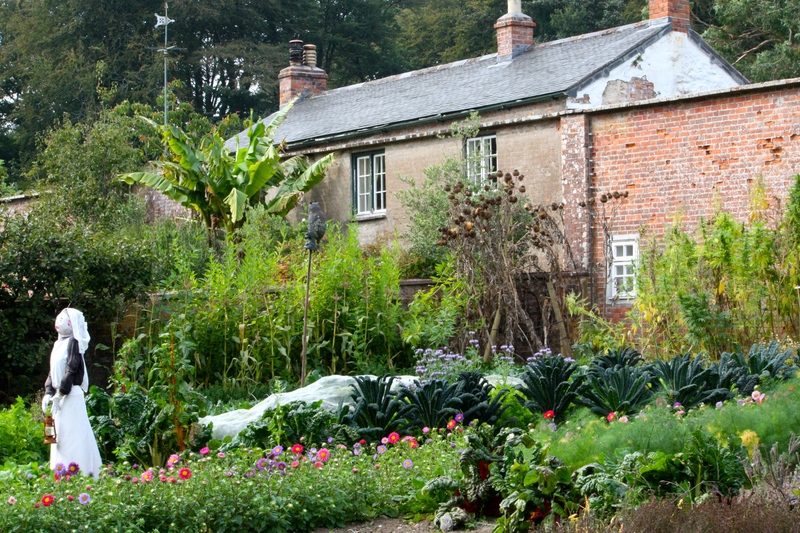 Trengwainton in West Cornwall is one such garden. Like an old friend it rarely changes except perhaps for the horticultural equivalent of a new hairdo. Since those earliest visits the carpark has grown (as, sadly, have all National Trust carparks), smart visitor facilities have been built and the productive side of the walled gardens has been reinvigorated. Apart from that, change has been organic, the 90 year old gardens progressing gently towards the centenary of their creation by one Lt-Col. E.H.W. Bolitho. On retiring from the army Colonel Bolitho became High Sheriff of Cornwall and was later knighted. His horticultural masterstroke was to recognise that his head gardener, a Mr Creek, had a gift for propagation. He was given carte blanche to develop his talents at Trengwainton. Other great Cornish gardens, including those at Caerhays Castle, supported the creation Col. Bolitho’s pleasure grounds, offering seasoned advice and gifts of plants collected around the globe. In 1926 Col. Bolitho joined a triumvirate of investors, including Lawrence Johnston of Hidcote and George Johnstone of Trewithen, to back Kingdon Ward’s 1927-8 planting hunting expedition to North East Assam and Upper Burma. Rhododendron seeds found on that trip gave rise to the garden’s enviable collection. 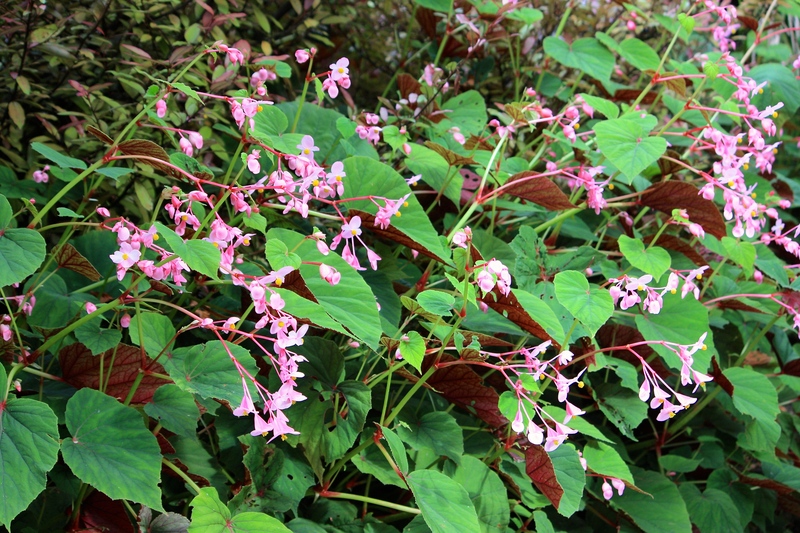 Mr Creek’s expertise, combined with the mild Cornish weather, meant that several species flowered for the first time in the British Isles at Trengwainton. From then on there was a great flurry of development, including the creation of a stream garden, planting of further shelter belts and extension of the walled gardens to create space in which the Colonel could cosset his most tender plants. 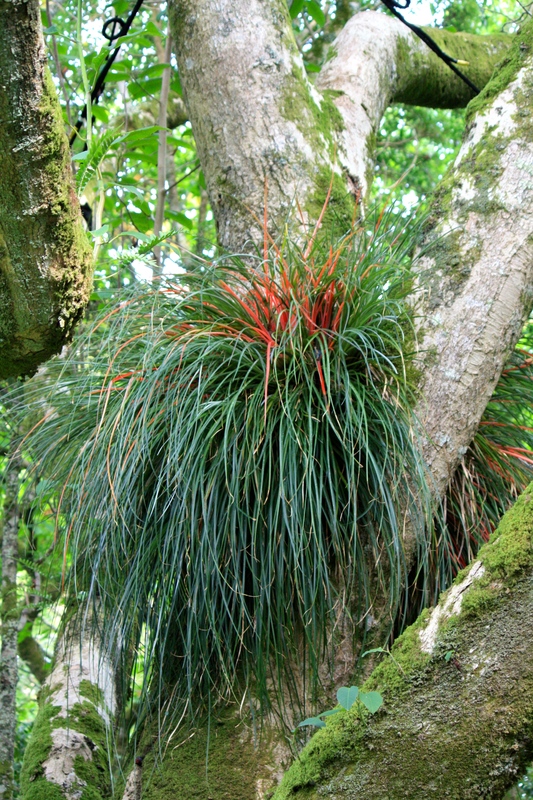 To this day Trengwainton remains the only UK mainland garden with conditions warm enough to cultivate many sub tropical plants, making it very special indeed. 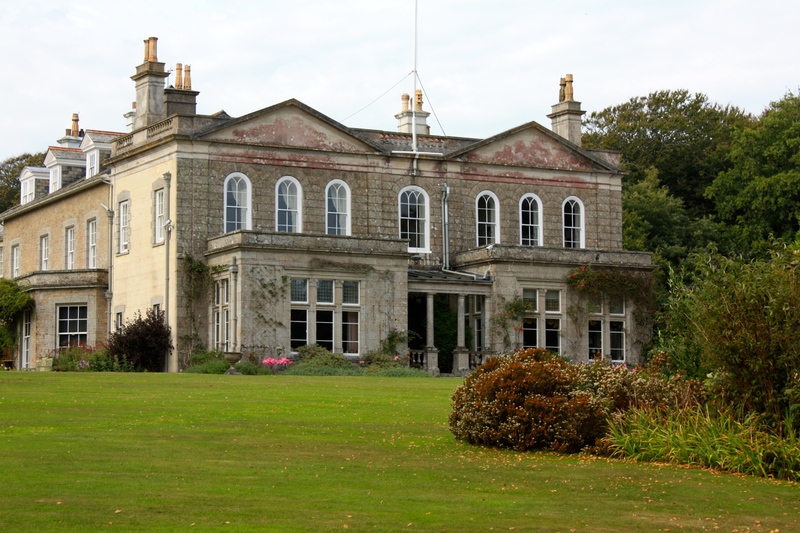 Although the gardens had welcomed the public since 1931, they did not pass to the current owners, The National Trust, until 1961. Thanks to West Cornwall’s relative remoteness and the large scale of the gardens, commercialization remains relatively low-key. On a quiet day the winding paths can be enjoyed very much as Colonel Bolitho would once have appreciated them. Surely he would be overjoyed to see the towering scale of his tree ferns (Dicksonia antartica), which now stand 4m high with trunks the size of Grecian columns. My favourite part of the garden is the series of walled gardens, which were constructed before Colonel Bolitho’s tenure, in the 1820s, to the floor plan of Noah’s Ark. It’s in these cossetted confines that may of Trengwainton’s tenderest treasures flourish, including a fine collection of fuchsias from around the globe and Chilean rarity Jovellana violacea. For the keen plantsperson this series of enclosed ‘rooms’ with their balmy microclimate is heaven on earth – I could spend hours wandering from one to another with notebook and camera in hand. Some of the plots have enormous magnolias planted at their centre, sending their low, sweeping branches out to fill every corner. 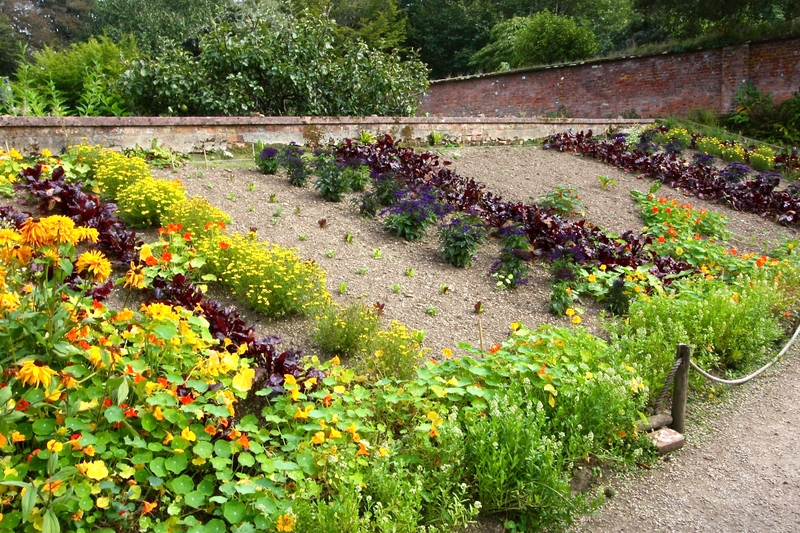 Each subdivision of the walled garden features steeply sloping, west-facing beds. These were designed to catch the rays of the sun and bring forward crops of fruit and vegetables, which might already be among the first in the country ready for picking. 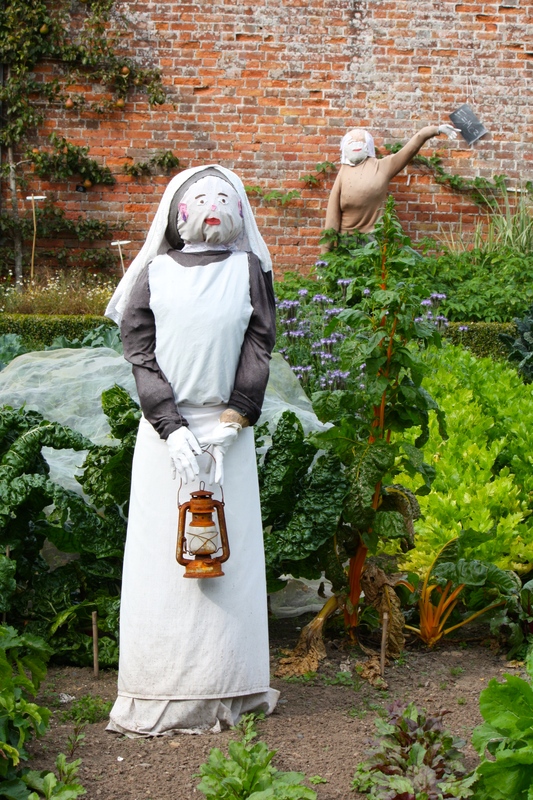 Modern-day Trengwainton enjoys the additional adornment of scarecrows in the guise of famous historical characters …..
A scarecrow, impersonating Florence Nightingale, keeps watch over the chard with Einstein in the background! 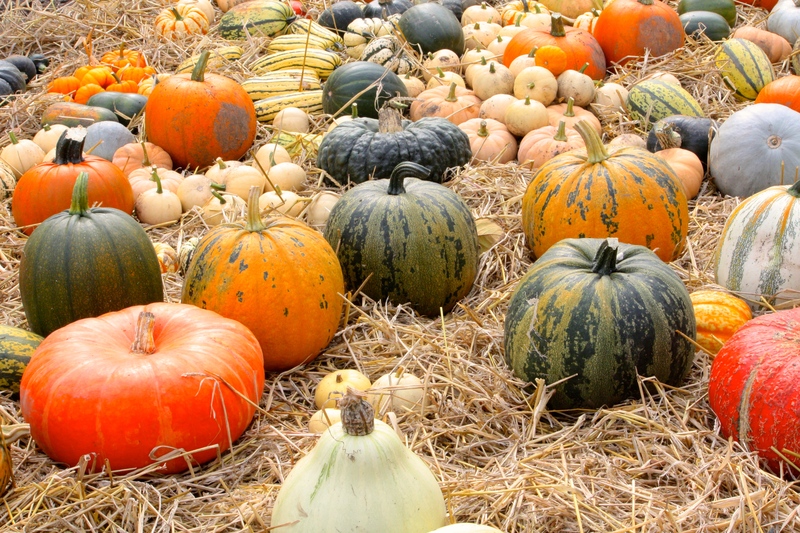 ….. and at the time of our visit in late September a magnificent harvest of pumpkins and squashes was laid out on a bed of straw, allowing the fruits’ skins to toughen up before storing, eating or carving into Jack-o’-lanterns. Like an old friend I have a feeling Trengwainton and I will be reunited again very soon, although I am quite certain of which of us is going to age better! Trengwainton’s balmy environs are worth a visit at any time of year, although winter opening dates are restricted. Check on the National Trust website for further details. It is a interesting that your life long passion started with some nature trips with your parents to keep you out of trouble. 🙂 Look how far you have progressed. Propagating is something I’d really like to pursue.